Well, it has been quite the busy week. I missed my initial posting about this week’s reading, and instead spent a few days entertaining my family, who came out to visit for Christmas. We had a great Christmas, and the kids got a visit from Santa (he actually came to our house!). After the family left, I caught a bought of the flu, and have been battling a fever for the past few days. I have had plenty of time for reading, being stuck on the couch in my (new) heating blanket (thanks, honey!) for the last few days. This week, I kept with the “Month of Holidays” theme for December, and tackled Charles Dickens’ Christmas classic A Christmas Carol. I had never read this book before this week, although (like most people) I know the story very well, having seen various movie adaptations over the years. One of my favorites was the one with Patrick Stewart, although my family has been watching a lot of A Muppet Christmas Carol recently. I really enjoyed this book! Although I know the story, it was beautiful reading Dickens’ words. The story is a quick read, and very entertaining. It’s interesting to read the book and know what had been changed in the various movie adaptations, as well as what was kept the same (most of the dialogue). Ebenezer Scrooge is truly a loathsome character in the beginning of the novel, who experiences a sort of redemption though a supernatural experience. But was it ghosts, or was it simply a dream? It’s amazing what a giant story Dickens manages to tell in a short 100 pages. All of his characters – from Scrooge to Fred, to the three ghosts – are all well developed, and a reader feels connected to them throughout the story. The book is just five brief chapters – the introduction, the visit from the first ghost, the visit from the second ghost, the visit from the third ghost, and the resolution – but those five chapters tell such an important story. It’s no wonder this book has stood the test of time, and become a permanent part of the Christmas season. 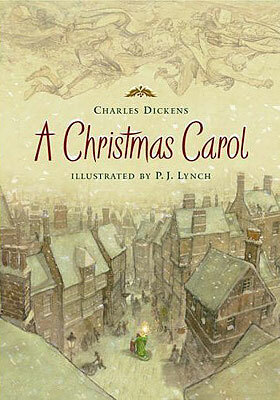 I’m sure you’ve seen a movie, but have you ever read A Christmas Carol? For me, this book inspired feelings of nostalgia remembering all the Christmases I’ve watched various movie adaptations with my family. Reading this book made me feel connected to something larger than my little Christmas gathering, and helped me remember that there are millions of people celebrating this time of year – many who have a special place in their heart for this story.